Complete information about the World and its cities. The colourful states of Rajasthan and Gujarat, the exotic Goa with the rugged Maharashtra with the union territories of Daman and Diu, form the western part of India. Along with the colorfulness, the songs and dances make a prominent impact in the festivals all over India. Western side is no exception with typical food items prepared for particular festival. The Desert State of Rajasthan is famous for its vibrant celebration of festivals. The Gangaur festival is very much similar to that of the one celebrated in Madhya Pradesh. In Rajasthan too it is celebrated around March when the ladies bring home the Gauri, wife of Shiva and worship her and then on last day immerse the idol. The ladies throughout the festival sing songs and dance. They decorate themselves with henna on their palms and wear all the traditional jewelery. The Mewar festival takes place in the lake city of Udaipur during this time. An exhilarating welcome to spring, this festival is a visual feast with Rajasthani songs, dances, processions, devotional music and firework displays. An unusual procession of boats on the lake offers a fitting finale to this splendid celebration. The Urs held every year in the scorching month of May, at the dargah of Sufi Saint Khwaja Moinuddin Chisti in Ajmer commemorates his symbolic union with God. Pilgrims from all over the world gather here to pay homage. Qawalis and poems are presented in the saint’s honour. At the huge fair that springs up at this time, religious objects, books, rosaries, embroidered carpets and silver ornaments are on sale. Celebrated in the month of February in Dungarpur, the colorful Baneshwar Fair is considered to be a tribal fair. Dedicated to Lord Shiva, the Lingam is bathed with milk and applied saffron. On this day the Lord gets offerings of wheat flour, pulses, rice, jaggery, ghee and even salt and chillies, with coconut and cash. The main attraction of this festival are the Bhils attending Baneshwar Fair singing traditional folk songs in high pitched voices sitting around a bonfire every night. Teej is the festival of swings celebrated in August. Dedicated to the Goddess Parvati, it marks the advent of the monsoon. Swings are hung from trees and decorated with flowers. Young girls and women dressed in green clothes sing songs in celebration of the advent of the monsoon. Goddess Parvati is worshipped by seekers of conjugal bliss and happiness. An elaborate procession is taken out on the streets of Jaipur for two consecutive days on the festive occasion. Down south of Rajasthan is Gujarat. One of the prehistoric states of India, Gujarat’s history goes back to the Jurassic age. Also famous for the Indus Valley civilization, this state is unique in its geographical features as well. A vast sea coast, jungles with ferocious lions and always welcoming people, Gujarat, the land of Gurjars, is a truly vibrant state. Dwarka once supposed to be the capital of Lord Krishna, is in Gujarat. Gujarat celebrates approximately 2000 festivals in year out of which most are regional based fairs and festivals dedicated to the deity. Some of the famous are The Kite festival. It is an international kite festival held during the Makar Sankranti in January. People from the world come to participate in this internationally acclaimed festival for a display of their kites. The Dang Darbar coinciding with Holi in March is another big event in Gujarat. Held in the Ahwa region and Dang district it is a unique celebration of Holi by the tribes. Countless tribal people from the adjoining districts participate in the fair dressed in colourful traditional outfits dancing to the beats of drums. The huge Janmashtami celebrations held in Dwarka, the abode of Krishna is a delightful sight. The most important festival celebrated by the Gujaratis is the Navaratri in October, before Dushera. Navaratri is an auspicious occasion that commemorates the worship of Divine Mother Goddess and her numerous manifestations. The nine-day cultural extravaganza wraps the entire Gujarat. During Navratri, a pot with attractive designs is ceremoniously placed a light is placed inside. Religious texts are read out and people fast and later cook Gujarati delicacies to eat. The main feature of the Navaratri of Gujarat is its typical dance called the Garba raas. Mostly all the Gujarati ladies can dance the Garba, a rhythmic dance, danced in a circle with clapping hands and traditional songs to accompany with. The rhythm which is initially slow grows faster and the dancers match their footsteps along with that fast rhythm. Another Dance form performed during Navaratri in every nook and corner of Gujarat is the Dandiya. The concept is the same, only here men too can participate and the dancers use small sticks to give a rhythm. Every street in Gujarat is decorated and people come in their fineries to participate in the dance. The mood, the attire and the music are so upbeat and vibrant that every year, the festival attracts tourists from India and abroad. Diwali celebrated all over India in October is celebrated with equal vibrancy in Gujarat as well. It has a particular significance for the Gujaratis as the third day of Diwali is the New Year of the Gujaratis and is celebrated with much pomp and show all over Gujarat. People start their new businesses and wear new clothes and do all that is good on this day. The rugged state of Maharashtra has a vast coast line starting from Gujarat and extending till Goa. Peaceful co existence of various religions is Maharashtra’s highlight, and is seen ff and on through the celebrations of various festivals. The Gudhi Padava or the Marathi New Year celebrated in April begins the year full of festivity in Maharashtra. The Marathis place a long decorated stick in front of their houses calling it Gudhi to welcome the New Year. They worship the Gudhi and start new ventures on this day. Nagpanchami comes with onset of Shravan month falling in August. This festival brings in a list of festivities that go on till January. Nagpanchami is dedicated to Snake God. The ladies worship the snake and request him to leave the fields for some time so that the men folk can begin sowing and ploughing. The Parsi New Year of Pateti is celebrated within the Parsi community of Mumbai, Maharashtra with much gaiety and fun. The Parsis visit the Agyaris and later spend the time with families and friends dancing, singing and eating good meals. The coastal Maharashtra celebrates the Narali Purnima, worshipping the Sea God and offering Him coconut, on the full moon day falling in August. This day is also celebrated as the Raksha Bandhan day. Sweets made of coconut are prepared and distributed. Fifteen days after comes the festival dedicated to the cattle especially the bulls and the Oxen. Maharashtra being agriculture oriented state, Oxen carry immense importance in the lives of the farmers who earlier used to plough their lands with the help of these Bullocks. On the day of Pola, the farmer decorates his cattle, worships it and feeds them with goodies. It is a rest day for the Oxen and the cows and no farmer works on this day. Within a week of Pola, in September comes the most famous and most lavishly celebrated festival of Maharashtra, Ganesh Chaturthi. Lord Ganesh, the patron deity of Maharashtra, is the God of wisdom. The festival is an eleven day festivity is the largest of its kind celebrated in India, with worshipping of idols and their immersion for ten continuous days. Dedicated to Elephant god Ganesh or Ganapati the festival celebrates the birth of the God. The whole of Maharashtra is in festive mood during this time. Idols are brought home and worshipped for ten days and immersed on the last day with people shouting, Ganapati Bappa Morya, pudhchya warshi Lawakar ya!! The Marathis also have the community celebration when huge Pandals are put up and huge idols of the Lord are installed for ten days and worshiped. Immersion too is a huge procession and the Marathis bid a tearful farewell to the God and wait for the next year to come. For ten days various cultural programmes are arranged like music concerts, orchestra, plays and skits. Some social activities are also undertaken like blood donation, scholarships for the needy or donation to the people suffering from any kind of natural calamity. In between these ten days, Gauri, Ganapati’s mother too arrives. She too is worshipped and prayed for three days and later immersed. The Dushera and Diwali are celebrated with equal fervor as that of the rest of India. Come December and the preparations for Christmas begin in Mumbai, the hub of Christian community in Maharashtra. Churches and streets are decorated; the Christians hang stars in front of their houses. Bakeries overflow with goodies. A small replica of the scene depicting the birth of Jesus Christ is made in front of houses and Churches. Carols are sung on streets and Santa Clause can be seen in stores. Midnight and morning masses are held and attended even by Hindus. The air of festivity continues till the New Year arrives. On the New Year eve, streets are decorated and people stay awake the whole night welcoming the New Year. The small state of Goa is perpetually in a festive mood all through the year with some or the other fair in the state. 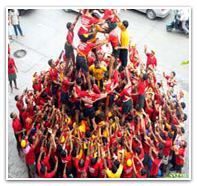 The Christians call it feasts, the Hindus call it jatra and the Muslims call it Urus. Three names but one sentiment… celebration. It means worshipping and praying the deity, eating goodies, drinking, dancing, singing, buying and selling and basically merry making. Although each religion has their own festivals all of them carry the typical Goan flavour. All the festivals and Jatras are celebrated with great fervour and enthusiasm by one and all. People from all walks of life, rich or poor, old or young, Hindu or Christians celebrate the festivals together making it a Goan festival. The Hindu festivals of Goa are similar to that of State of Maharashtra. The other unusual festivities of Goa are the festivals dedicated to local deities which later get converted into fairs. One such example is the Vasco Saptah. A week long festivity dedicated to Lord Damaodar, who according to legends once cured the on going epidemic after the worshiping, started. 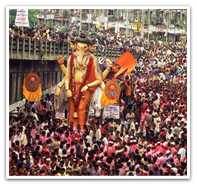 Held before the Chovoth, or the Ganesh Puja, similar to Maharashtra, this festival is held only in the town of Vasco. Apart from Easter, Good Friday and Christmas, there are end numbers of typical Goan Feasts celebrated by the Christians of Goa. Touxeachem Feast is held in the magnificent Church of St Anne also known as the Santana Church. It is dedicated to St Anne and the feast is celebrated on July 29. Touxeachem Fest (in Konkani) literally translates as the Cucumber Feast in English. The procession of Saints is the only of its kind taking place in India when the sleepy village of Goa Velha hosts this renowned and honoured Procession of the Saints on the first Monday of Easter week. The Feast of St. Francis Xavier is when Ceremonies to honour the death of St Francis Xavier who lies in a silver casket in the Church of Bom Jesus in Goa take place. The celebrations take place on December 3, the day he was buried. This day takes the shape of a great fair in the area. The small union territories of Daman Diu and Dadra Nagar Haveli, being near to Gujarat, celebrate the same festivals that of Gujarat and Maharashtra. Being under the Portuguese rule, though they still carry the Portuguese impression and the Christian festivals like the Christmas are celebrated in their own unique way. © P I Infosoft Private Limited. Travel theme. Powered by Blogger.